The design discipline is deeply interwoven with the patriarchal structure of our society. The initiative depatriarchise design deals with analysing this complicity of design in the reproduction of oppressive systems and imagining visions for alternative futures. Through discussing the societal issues within design practice through an intersectional feminist perspective and through developing hands-on approaches, the initiative aims to bridge theory and practice. 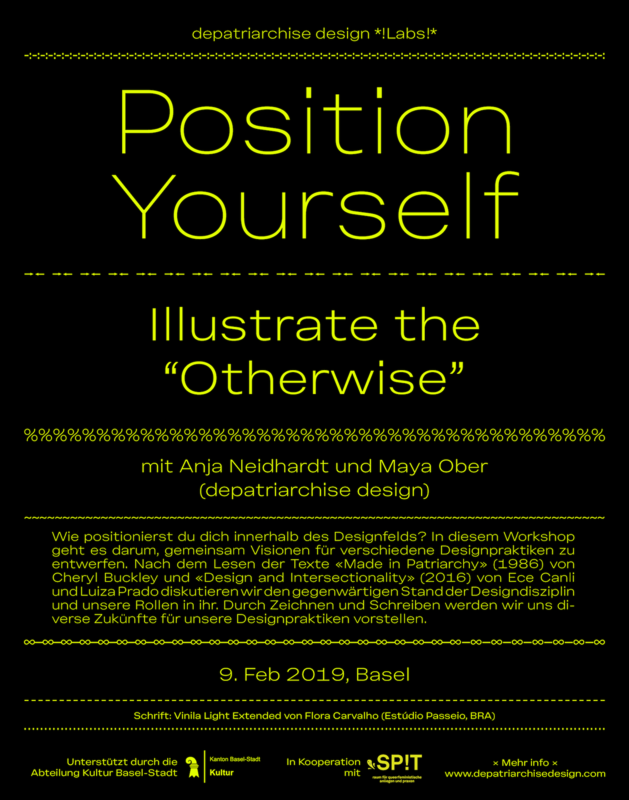 depatriarchise design now starts a series of workshops with three events in Basel. The depatriarchise design *!Labs! * are spaces where you can explore design from feminist perspectives, exchange ideas, find allies, and create hands-on tools for your own daily design practice. Each *!Lab! * is an educational experiment trying to expand and to question the established ways of teaching, learning, producing and displaying design. The *!Labs! * are rooted and inspired by feminist pedagogy. They are spaces for dialogue, personal expressiveness, caring and unlearning – they are never meant to be finished, rather form part of a larger process of depatriarchising design. How do you position yourself within the design field? This workshop aims at imagining diverse design practices through illustrating and writing activities. After reading Cheryl Buckley’s text “Made in Patriarchy” (1986) and “Design and Intersectionality” (2016) by Ece Canli and Luiza Prado, we will discuss the current state of the design discipline and our roles in it. The creation of drawings and texts will then help us to imagine different futures of how our design practices could be. Design is political. This statement is at the core of Vitra Design Museum’s current exhibition which discusses it through focusing on the work of Victor Papanek. We will conduct a field trip to “Victor Papanek: The Politics of Design” to not only find out which contents it communicates and how, but also to examine to what extent the museum translates the upheld values into the design of the exhibition itself. After a “food for thought” introduction that blends together aspects of statistics, infographics, pizza, and politics, we will team up to analyze the gender (dis-)balance of recent design exhibitions and awards across the globe. Working in groups, we will turn our statistical findings into pie charts, and bake them into real-life edible pizzas at Unternehmen Mitte. Our efforts will lead to a communal dinner, where the general public will be invited to take a slice and talk politics. Nina Paim and Corinne Gisel from common-interest were commissioned to design the overall visual identity of depatriarchise design *!Labs!*. They proposed to use it as a platform to support and promote young female type designers. For each workshop, a typeface by a different female designer is selected and purchased. By creating a singular identity for each workshop, the visual identity of ‘depatriarchise design *!Labs! *’ will grow into a diverse set of positions. At the same time, the identity will function as a type-specimen that promotes emerging names and thereby becomes a feminist tool for graphic design in and of itself. Participation is free of charge. Please sign up via E-mail.